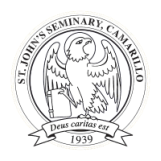 (3) approval by the Rector/President of St. John’s Seminary. 6.2.3. By order of the Rector/President of St. John’s Seminary.